One of our lovely fans told me a few weeks ago that she tried making waffles with our biscuit dough and had delicious results. After so many biscuit dough experiments I couldn't believe I hadn't thought of this myself! I waited until I had a good friend in town to help me eat them (this is key). The Biscuit Child brought over her waffle iron and we rolled up our sleeves and got to work. All you need to make Biscuit Waffles is one box of Robinhood Meetinghouse biscuits, any flavor you wish. (We used Blueberry Biscuits, Triple Ginger Biscuits, Sweet Potato Biscuits and Double Chocolate Biscuits.) You should also make sure you have some non-stick cooking spray handy - we sprayed our waffle iron liberally before each waffle. Pull your biscuits from the freezer and spread them out on a piece of parchment paper or wax paper on a pan. Let them thaw for about 10-15 minutes. Cover with another piece of wax paper and press firmly down, spreading the dough as thinly as you can. These dough pieces will be your waffles. 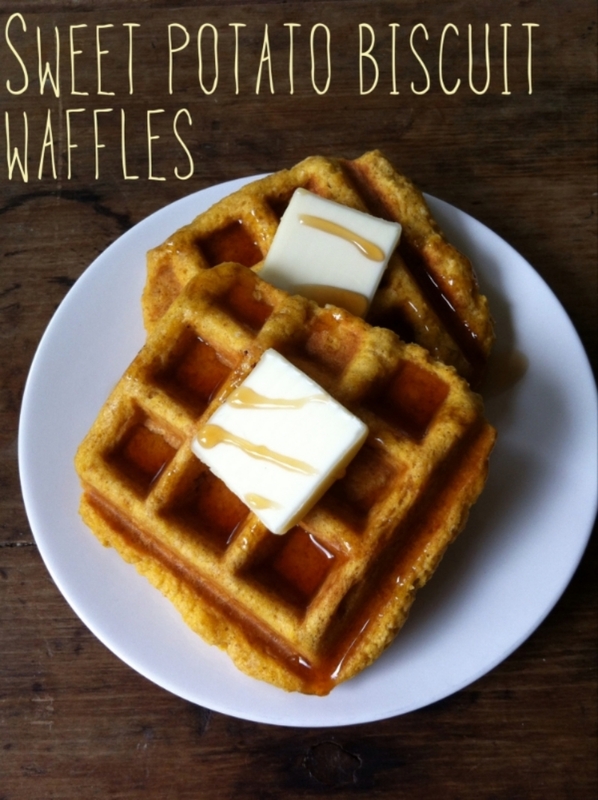 Heat up your waffle iron according to whatever quirky heating needs it has (each one is different). Spray the iron liberally and place dough on iron, press down gently. Biscuit waffles will take a little bit longer than regular waffles to brown. Mine took about 8 minutes. Pop them out with a fork, butter them up and pour the finest Vermont Maple Syrup you can buy all over them. My favorite butter to use is Kate's Butter from Old Orchard Beach, Maine and my favorite maple syrup is Coombs Family Farm Organic Maple syrup. Our results were oh-so-delicous. We truly stuffed ourselves with biscuit waffles and had a wonderful, lazy morning. Besides the incredible taste this recipe has almost no dishes or mess! After I made these waffles I called up the Ninja Biscuit Monger and he made them with Cinnamon Rolls - awesome!